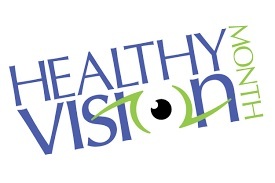 MAY IS HEALTHY VISION MONTH...LEARN HOW TO PROTECT YOUR VISION! Healthy Vision Month is a time to raise awareness about eye health and strategies to help prevent vision loss and blindness. Eye floaters are those tiny spots, specks, flecks and cobwebs that drift aimlessly around in your field of vision. While annoying, ordinary eye floaters are very common and usually aren’t cause for alarm. These floaters appear when tiny pieces of the eye’s gel-like vitreous break loose within the inner back portion of the eye. When we are born and throughout our youth, the vitreous has a gel-like consistency. But as we age, the vitreous begins to dissolve and liquefy to create a watery center. Some undissolved gel particles occasionally will float around in the more liquid center of the vitreous. These particles can take on many shapes and sizes to become what we refer to as eye floaters. You’ll notice that these floaters are particularly pronounced if you gaze at a clear or overcast sky or a computer screen with a white or light-colored background. You can’t actually see the tiny bits of debris floating loose within your eye. Instead, you’re seeing the shadows from these floaters that are cast on the retina as light passes through the eye. When are floaters and flashing lights a medical emergency? Noticing a few floaters from time to time is not a cause for concern. However, if you see a shower of floaters, especially if they are accompanied by flashes of light, you should seek medical attention immediately from an eye care professional. The sudden appearance of these symptoms could mean that the vitreous is pulling away from your retina. This is called a vitreous detachment. Or it could mean that the retina itself is detaching. As the vitreous gel tugs on the delicate retina, it might cause a small tear or hole in it. When the retina is torn, vitreous can enter the opening and push the retina farther away from the inner lining of the back of the eye leading to a retinal detachment. Sometimes retinal holes and tears are asymptomatic and are only diagnosed on routine dilated eye exams. Make sure that you are seeing your eye care professional regularly. Always call with sudden changes and concerns regarding your vision and eye health. Our doctors are here to answer all your eye care questions. Schedule your exam today.